Key marketing tips to unlock the potential of your home performance customer base. I get this question all the time: What is the most effective marketing? Contractors are rarely satisfied with my answer: “Your most effective marketing is what works best for you.” Marketing, which permeates everything you do, is unique to each company. Finding the right answer involves planning, tracking, adjusting. And since the right answers change over time, that means more planning, tracking, adjusting. Forever. For basic starting points, you need to do three things: plan, budget, and continually track results. These three steps should be within the ability of most contractors in the home performance world. The vast majority of successful contractors I know do these things. Here are the three starting points for your success. Figure A. Home Performance contractors say that customers want them to make their homes more comfortable, more than for any other reason. This is not the most effective way to keep track of your potential customers! Copyright © 2013 by Mike Gorman. Reprinted with permission. Email: mgbok@aol.com, call: 1-800-218-5149, or visit: www.techknowledgeonline.net. This plan can be simple or complex. But it has to take into account your business, your customers, your market, and the ecosystem where these come together. It has to take into account the fact that your customers’ needs change throughout the year. You don’t necessarily want to be pushing the high-efficiency furnaces on a radio campaign that starts July 1. The A/C campaign might not gain traction in New Hampshire in December. Your plan should reflect a deliberate approach, weighing leads needed in busy and slow times, and the messages that correspond with those leads. I like breaking this plan down monthly, since that’s how I break down an annual plan, and how I look at prepared financials. But even a simple quarterly plan will do. Planning ahead also means you can work out messages and campaigns carefully, rather than throwing them together at the last minute. If you know you’re going to run a furnace replacement schedule in September, you don’t have to wait until Labor Day to develop the ad. If you know you’re likely to see ice dam problems in January, you can develop that radio spot months ahead of time. Your budget will tie into your marketing, your annual business plan, and your cash flow analysis. How much should you spend? Again “It depends.” Hopefully you have some historical information from your business to draw from. If not, here are some reference points that you can start with and refine as you gain experience. I've surveyed dozens of contractors over the past couple of years. From this, it seems the average home performance contractor spends 7-8% of gross revenue on marketing. That's not a bad starting point for consideration. But don't take the as the ideal range for your business. If you’re kick-starting your business, your marketing budget could go as high as 20%. Likewise, even for mature businesses, if your plan calls for strong growth and a boost in market share, you’ll have to bump that 7–8% up several points. With more conservative plans, you might be in the 4–5% range. And if you’re an established HVAC company adding home performance (HP) to a strong existing business, you might spend only 2–3% of your budget on marketing the HP portion of your business. Just make sure your spending lines up with your overall business plan. Within the overall marketing budget, I’m most comfortable with spending 15–20% on branding. Branding includes things like uniforms, vehicle branding, yard signs, and business cards for staff. You will get leads out of this, but you’ll also grow awareness and support your professional image. So with your plan and budget mapped out, jump in and pump out the creative marketing messages using your chosen media channels. And then track results. Determine how different messages and media are working—the volume of leads and sales each one generates. The dollar volume of business and the return on your marketing spend are critical. Without tracking and evaluating messages and media, you’re just guessing. Let’s say the average cost of acquiring a new customer is $250. (When I ask contractors, I usually hear it’s in the $200–300 range.) If you look at a particular campaign, and see that it costs $476 per new lead generated, you should recognize that this campaign may not be sustainable. On the other hand, if the lead costs $95, you might think: Excellent! Don’t make the mistake of thinking that it’s just about leads, though. Leads are only an early indicator of response to your marketing campaign. You ultimately need to track how many leads convert to sales. Maybe those $476 leads close at 80%. That might work. What if those $95 leads close at 10%? They don’t look so attractive now. This lead cost per sale, or what some call a cost per acquisition, is critical. And it’s why those $35 leads from an online lead mill might not be worth the time of day. From time to time, I like to dive deeper and look at things like the revenue generated by lead source or the service agreements by lead source, but I think those numbers are most useful for finding long-term measures of success, not as an early indicator of response to your marketing campaign. Some campaigns won’t work—you can tweak them, or dump them completely, until you’ve got a set of campaigns you’re comfortable with. Keep doing what works. Change or stop doing what doesn’t work (even if worked great two years ago). And always be dabbling in a couple of new ideas, because sooner or later, what used to work won’t work anymore. You don’t have to make this complicated. The marketing planning and evaluation tool available for download (see Learn More section below for URL) can help you get started. Ideally, you would tie this tool directly into your customer relationship management (CRM), financial, and tracking systems. However, even the manual method in this tool is a start. And it’s better to start planning today than to put it off until tomorrow. Don’t expect the words “home performance” to make your phone ring. People don’t know what home performance is. If that’s all you talk about, your call-center will be silent. People call for widgets (like furnaces, air-conditions, insulation, windows). They call for comfort issues (rooms that are too hot, too cold, drafts, etc.). They call for others reasons. 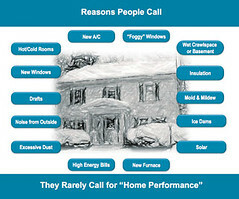 But most people don’t call for home performance, a blower door test, or just to talk with a BPI certified contractor. You can work those in as differentiators once the conversation is started, but don’t rely on them as the headline. Don’t assume your “old” marketing still works. What worked yesterday might not work today. You need to track and evaluate. If it’s not helping generate leads (or otherwise helping your brand image or your sales), stop! Don’t assume with enough persistence the marketing that has never worked for you will magically start working. Sometimes patience is required to really see if a particular campaign will pan out. And yes, there’s some art and judgment calls to be made. But don’t be the business that spends thousands of dollars a year (or a month!) on ads, programs, or great ideas that just don’t work. Track and evaluate and dump the junk. Don’t ignore the way your employees, vehicles, or work sites look. Whether you think it should be that way or not, people infer a lot about how you’ll take care of them and their homes based on your appearance. Marketing is everything you do. It includes the quality of the work you do. It also includes how you project your company in a variety of ways–in every way. Don’t be the last contractor in your area to sign up for the hot new marketing program. You do want to pay attention to the competition—and if something really looks like it works, give it a whirl. But rushing into the same channels with the same messages as all of your competition is not a great way to stand out. If you’re not differentiating, you’re paying to help generate your competitions’ leads. Work on messages that are yours alone. Dare to try different approaches. And build on opportunities unique to you. Don’t keep waiting for “Home Performance” to be the next big thing in the Yellow Pages. In the good ol’ days, maybe Yellow Pages was all you needed. Now, you may find they barely work at all. If you’re spending more than 10% of your marketing on the YPs, you’re probably spending too much (or you’re not spending enough on other channels). It’s not unreasonable to drop the YPs completely. However, if you’re not spending any, you probably won’t get my mom as a customer. Of course, if you’re measuring and evaluating, you know whether you’re spending too much. Don’t build your marketing life around co-op ads. Whether from manufacturers, distributors, and a home performance program you’re participating in, co-op funds can provide a great opportunity. I love the idea of tapping into co-op benefits to cut costs and boost exposure. But don’t sacrifice your message, your brand, or your differentiators just to access co-op dollars. If the requirements make sense for you, by all means grab the cash. If not, don’t worry about it. Remember you need to differentiate on the value you bring, and your advertising should help you do that, not bury you behind a brand that your competition uses, too. Don’t ignore planning, budgeting, tracking, and evaluating! Read my last post. Don’t just wing it. Figure out how much you want to spend, how much you can spend. Prepare creative ahead of time. And track, track, track, so you know what’s working and what isn’t. You can keep the good and fix or drop the not so good. Successful contractors who’ve been around at least a few years will tell you that referrals are a huge driver in their business. While HVAC contractors have an advantage, all contractors can tap into existing customers to some extent. You can approach them before a service contract or warranty expires. You should have someone in your office maintaining contact with existing customers via newsletters, reminders about routine maintenance, or recommendations for improvement. People will look first to the company they already have a relationship with when it’s time to do more work or when another problem surfaces in their home, but not if you haven’t shown customers that you are interested in them and are ready and willing to help. Even when existing customers aren’t ready for the next purchase, if you’ve done a good job for them they can help you bring in new business. You should ask for testimonials regularly from the people you’ve helped solve a problem. Regardless of the approach—whether you choose testimonial pages, sliders on your web site, video, or case studies—success stories attract people to your company. You should also learn to ask for referrals. You can even offer rewards for referrals, in cash, services, or donations to charity. The more you ask and the easier you make it, the more likely it is that good customer experiences will turn into additional business from friends, family, and neighbors. You Got the Phone Call—Now What? The phone rings! Congratulations—your marketing worked, and you’ve got a lead. Now you need to turn that call into an appointment, and the appointment into a sale. But let’s not get ahead of ourselves. Reinforce your company’s image and messaging. Collect the pertinent customer information. Find out how the customer heard about you. Qualify the lead to make sure you can afford to run with it. Prepare the customer for the appointment and sale. How you answer that phone—or not answer it—is important. Most people prefer a friendly, lively voice to a grumpy greeting, voice mail, or phone tree. If you’ve got the volume to justify the resources, have someone answer the phone! 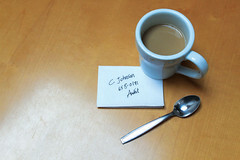 If you have to use voice mail—as many small owner-operated companies do—return calls promptly. Some companies use a branded phrase. Others opt for something more standard: “Hi. Welcome to Aardvark Cooling. This is Mike. How can I help you today?” Warmly say hello, state who you are, and ask your first open-ended question. Make sure everyone in the company who answers phones does it the same way. Make them practice, role-play the greeting in your company meeting, and listen in as people answer the phone. Reinforce the need for energy and enthusiasm. This may seem awkward at first—and if it does, that definitely means you need practice. If you don’t get the customer’s name and phone number, it’s hard to call back! You need a standard way of collecting this. An electronic customer relationship management system (CRM) makes tracking customer info a lot easier. 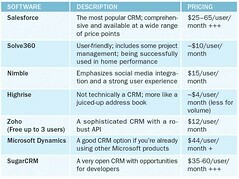 And CRM is quite affordable now (see “Guide to CRM for Home Performance sidebar). But even if you’re using paper, capture the information in such a way that you can access it. Ask customers the best way to contact them—and ask for an e-mail address to send them information. Right near the top of the list of questions you should be asking is “How did you find out about Aardvark Cooling?” The answer to this question needs to form part of the customer information because you want to know if an appointment was set, but also whether a sale was made, and for how much. The CRM lets you tie revenue back to the lead source and will help you evaluate where you should invest your marketing dollars. Customer relationship management (CRM) applications can be a valuable tool for home performance contractors, auditors, and various other home energy–related businesses, offering a low-cost suite of tools that allow you to manage your business more effectively and more efficiently than the methods of old. But what are the CRM options available, and which are most suited to the unique needs of the home performance industry? We’ve taken a look at some of the most popular CRMs on the market and broken down the basics to help you understand clearly the benefits. Keep in mind that at the end of the day, the CRM that works is the one that you use and that helps you. We recommend reading about each, trying out one or two, and ultimately choosing the one that you like. In the end, having the discipline to stick to it is the key to CRM success. An important note: for purposes of this guide, we’re sticking somewhat rigidly to software for managing prospects and customers. Project management (also called enterprise resource planning or ERP) is often lumped into the feature set of CRM’s, but this is generally a distinct feature set. When things are slow, you may want to visit every person who calls. During busy times, you want to do some triage. Most of the year, you’re probably not overwhelmed with leads. (If you are, you need to hire another salesperson and a couple more people to answer the phones!) So most of the time, I don’t view lead qualification simply as a way to prioritize and exclude leads. Rather, every phone call is a chance to learn, to build a common understanding between you and the customer, and to differentiate yourself from the competition. So, yes, you want to start establishing need. Often, the customer will express this need as a widget. “I need a new furnace” or “I want a quote for attic insulation.” That’s good; you’ve got a hint. But you want to get below the surface by asking a few good questions. You’ll also want to ask questions like “What are your plans for your home?” and “Are you interested in financing options?” It’s good to know whether customers have the interest and the ability to get good, permanent solutions, or just the cheapest Band-Aid so they can move on. Earlier, you asked how they heard about you. If they got your name out of the Yellow Pages, they might not know much about you. On the other hand, if you were referred to them by a friend (“My neighbor Bob had you guys over last year and recommended you”), they might trust you more and have a better sense of what to expect. Referrals tend to close at a higher rate than most other lead sources. So if this was a busy time, and I had to choose, I’d take the referral lead today and try to push out the YP lead until I could run with it (knowing that I might lose it to a competitor). A home performance audit is beyond the experience of most customers. Spend a couple minutes preparing them for the appointment by explaining what the adviser will be doing, how long it will take, and what your customer should have ready. If you need their utility bills (and you do! ), ask them to have the bills available. If they need to avoid lighting a fireplace for 24 hours, let them know. This explanation is something you’ll want to refine and practice over and over. And that really applies to the whole phone conversation. 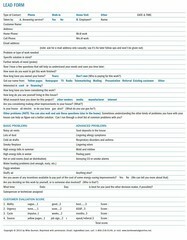 Again, do regular role-playing (see the link in Learn More) with staff who answer the phones. Asking open-ended questions to tease out real motivators takes practice, so practice you must on a regular basis to build and maintain skills and confidence. Ideally, you’ll have a computerized system to both record what you’ve done and prompt you to take the next step. But if you don’t, don’t let that stop you from capturing the lead in the best way you can. And whether you need a paper form or just want a few ideas to improve your computerized intake or scripting, check out Mike Gorman’s Home Performance Lead Form (see link, under Learn More, to full instructions for using the form). You’ll want to modify it to meet your own needs and your own voice, but it’s a very good starting point. You just paid a lot of money to make the phone ring. Make the most of it! Mike Rogers is the president of OmStout Consulting. A nationally recognized expert in residential energy efficiency, he works with contractors and programs to scale sustainable market approaches to improving homes. Discuss this article in the Marketing Energy Efficiency group on Home Energy Pros!